Why is this career so hot? Growth factors are the aging population, and research showing that good oral health is linked to good general health. So, if you’re interested in working in healthcare, enjoy interacting with people, and want some assurance that you’ll be employed, this may be the right career at the right time for you. What Do Orthodontists Assistants Do? Orthodontist assistants work with patients who are getting or already wearing dental gear such as braces and retainers. As an orthodontist assistant, you will help dental professionals install and check devices that straighten teeth and correct other oral problems. While state restrictions and your own level of experience will come into play, in some offices, you may also learn lab work, specifically pouring up and trimming patient molds. You’re often responsible for office tasks, such as maintaining patient records, handling inventory, and payments/billing responsibilities. Along with the formal training needed for this career (more on that below), to be a great orthodontist assistant, you should have good manual dexterity, good hand-to-eye coordination, an eye for detail, empathy and compassion, and good interpersonal skills. Regarding manual dexterity, currently, the majority—about 80 percent—of orthodontist assistants are women. They tend to have smaller hands, which helps when performing tasks inside mouths. But of course, this can be a great career choice for men, especially since so many orthodontists invest in new technology and new techniques, which are changing how procedures are done. Orthodontist Vs. Dental Assistant: What’s The Difference? If you’ve been researching dental careers already, you may have noticed that some sources don’t separate “orthodontist assistants” from “dental assistants.” That begs the question: What’s the difference between an orthodontic assistant and dental assistant? To begin with, dental assistants work in general dentistry offices helping patients toward general good dental health; orthodontist assistants work for orthodontists to straighten teeth and make other such adjustments. Orthodontist assistants see their patients much more often, since many orthodontist procedures require multiple visits. As a result, they tend to spend much more time working individually with patients than assisting the orthodontist. So, they generally need to be much more independent, flexible, and able to make judgments. On the other hand, dental assistants work directly to assist dentists who are performing procedures on patients. Most of us have observed dental assistants helping with suction and handing the dentist various instruments, for example. Dental assisting certificate programs take one year to complete and will prepare you for entry-level assisting positions alongside dentists. These programs generally focus on the technical aspects of the occupation, including dental radiography, chairside assisting, and dental materials. You’ll take laboratory and clinical classes. Associate degrees can be obtained at community colleges and vocational schools. These degrees take two years to complete. You will have to pass a dental certification exam, which includes a written and hands-on evaluation. You must pass both to receive your certification/license. 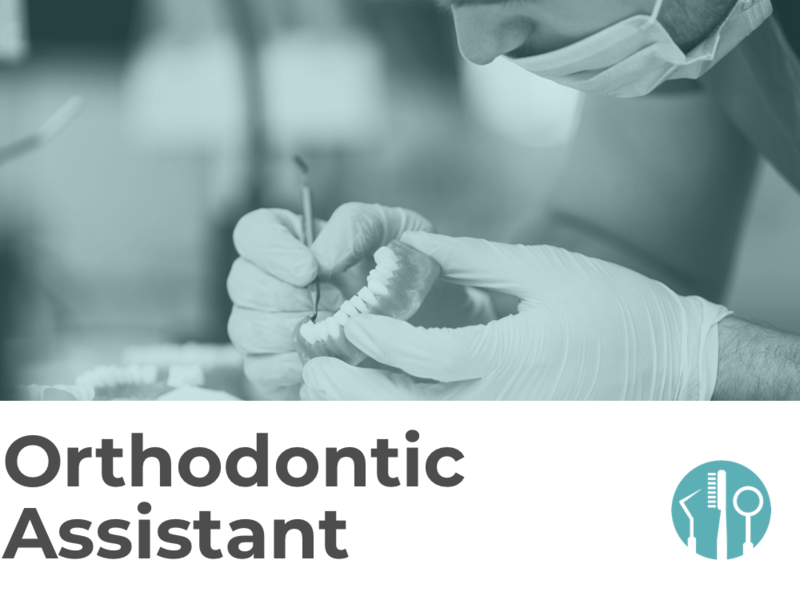 It’s important to know that some states recognize “orthodontist assistant” as a separate occupation, while other states group orthodontist assistant with dental assistant. Some community colleges offer a course in orthodontic assisting as well as dental assisting. Generally, in these cases, students must have completed a dental assisting program; they must be employed by an orthodontist who will oversee the clinical portion of the course. Luckily for those who work full time while pursuing this career, some courses might be offered online. Additional licensing and/or certification is required in some states. Certification is offered by the DANB—the Dental Assisting National Board. DANB awards the Certified Orthodontic Assistant (COA) credential to applicants who pass infection control and orthodontic assisting exams. Orthodontic assistants can qualify for certification through a combination of education, work experience, and/or other credentials, such as RDA (registered dental assistant), RDH (registered dental hygienist), or CDA (certified dental assistant). Once again, states vary on what is necessary. Some accept on-the-job training with no formal education, while others require formal training plus certification. The DANB tracks individual state requirements and is recognized by the American Dental Association as a national provider of certifications for dental and orthodontic assistants. How Much Do Orthodontist Assistants Make? The Bureau of Labor Statistics makes no distinction between dental and orthodontic assistants. According to BLS, the median annual wage for dental assistants was $37,630 in May 2017. Some estimates put it a little higher, at $39,595. Careers that are experiencing heavy growth translate to many job opportunities for you. What’s even better is when you can get into such a field quickly—and training to become an orthodontist assistant means you’ll have a solid career in not a lot of time!